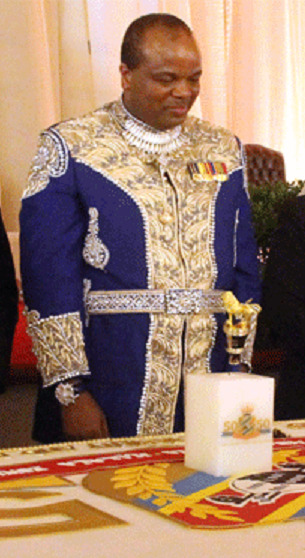 In the month that India donated US$1 million to help feed starving children in Swaziland, King Mswati III, the kingdom’s absolute monarch, wore a suit of diamonds weighing 6 kg and received a cake with 52 layers at his birthday party attended by 700 guests. A few days earlier he received his second private jet that after VIP upgrading might have cost US$30 million. Meanwhile, seven in ten of his 1.1 million subjects live in abject poverty with incomes less than US$2 per day and 640,000 of them in need of food. The Observer on Saturday, a newspaper in Swaziland in effect owned by the King, reported (21 April 2018) the cake was ‘fit for a King’. It reported, ‘The cake comprised of 52 layers and it was white and gold and part of the decoration on it was the silver number 50.’ It had been baked by a South African company. The Observer also reported the King wore a blue suit that weighed 6 kg (13 lbs) and took eight months to make. ‘It was hand made and beaded with diamonds,’ it reported. The King threw a garden party for 700 guests, including the President of Taiwan Tsai Ing-wen, and the Vice-President of Equatorial Guinea, Theodore Nguema Obiang Mangue, it added. The King marked his birthday while more than one in three of his subjects were kept alive by international food aid. The World Food Program has reported 350,000 people are in need of emergency food assistance, with 640,000 potentially affected by some degree of food insecurity at the peak of the lean season. In September 2017, it was found that some people in Swaziland were so hungry they willingly ate dog food, a newspaper in the kingdom reported. It came after residents looted a van full of dog food that overturned on the Manzini – Mbabane highway. A report in July 2013 called The Cost of Hunger in Africa, which was prepared by the Government of Swaziland working together with World Food Program, found that around 270,000 adults in the kingdom, or more than 40 percent of its workers, suffered from stunted growth due to malnutrition. As a result, they were more likely to get sick, do poorly in school, be less productive at work and have shorter lives. Poverty is so grinding in Swaziland that people, close to starvation, have been known to eat cow dung in order to fill their stomachs before they can take ARV drugs to treat their HIV status. In 2011, newspapers in Swaziland reported the case of a woman who was forced to take this drastic action.